Ever wonder if anti-gun zealots recognize the absurdity of their argument that guns are the cause of violence in our country? We joke about what’s next with the gun-grabbers – Once they ban all the guns in America, will they come for the knives? The left is always willing to blame the inanimate objects for being evil, not the criminals or terrorists. And they don’t even understand why it’s such a blatantly idiotic argument. Until now … This political cartoon illustrates how gun-grabbers can be willfully ignorant despite having the absurdity of their argument in plain sight. Be honest, you can almost envision that entire conversation taking place and the woman honestly having no idea why what she just said was weapons-grade stupid. 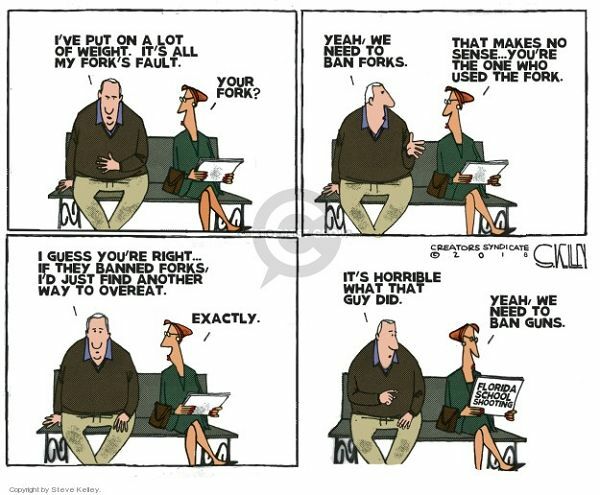 It’s not the first time a faux ban on utensils has been used to illustrate the liberal thought (or lack thereof) process in banning guns. But it’s the first time we’ve seen it done so well. And here you thought once they were done targeting guns they’d be content and leave you alone, right? While today will be guns, tomorrow will be knives, next week will be forks. There’s nothing too stupid for the left to try and legislate and ban from our lives. Don’t put anything past them. Like and share this post to explain to people how stupid gun bans really are!